Who would have thought cooking could be so fun? I certainly didn’t, nor did I think it could be so intense. 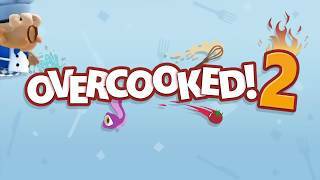 Yet, Ghost Town Games and Team17 had previously set out to prove me wrong with their surprise hit Overcooked, and its upcoming sequel looks to reaffirm that notion, with what could be a standout co-op multiplayer game for 2018. 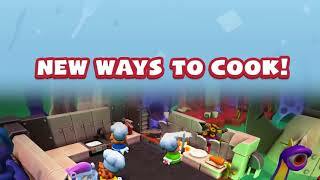 Overcooked 2 builds upon the charming formula of cooperative multiplayer cooking madness by throwing a plethora of ingredients at you, and tasks you with putting them together to make finished meals using knives, appliances, and your own wit. Much like the first entry, you must work as a cohesive cooking assembly line of sorts to crank out as many orders as possible in the allotted time. While doing so, you’ll have to chop, cook, and even toss ingredients at each other to do so. While the game holds more of a wacky fast-paced mini game vibe as opposed to a “cooking simulation,” as its dubbed, that doesn’t mean it’s a cakewalk. I definitely felt like I was under the knife and in the pressure cooker as I was scrambling to complete the ever-increasing list of orders and net high cash tips. But enough with the food puns - let’s get to the meat of my demo. Based off of our roughly 20 minute playthrough, the sequel seems to demand a high level of swiftness and attentiveness of what’s occurring around you, along with the ability to shift your brain quickly from one task to the next. Orders continue to pile up on the top left of the screen, often varying in their ingredients, and there are usually a number of things happening around you at once. The experience truly felt like being in a busy kitchen; just one that happened to feature Pixar-esque animal chefs and housed obstacles like conveyor belts, swinging platforms, and even an occasional teleporter. Gordon Ramsay certainly wouldn’t have been happy with my performance as an apprentice cook. I spent much of my time dropping food items off cliffs, getting in people’s way within the cramped spaces, and generally making a mess of things more often than I helped. This chaos escalated quickly as I drove our food truck across the cute toybox-looking minimap from one stage to the next. We were soon met with new food items and more unique settings, including an airship with shifting blocks and a dungeon-like area complete with collapsing bridges and pits. Having only played the original entry minimally, I certainly had to stumble through a bit of a learning curve, especially with the crazy dynamics within the demo. It proved a bit tricky to even locate my player on occasion, let alone make sense of what to do and when, amidst the chaos of three others scrambling about. Though I still had a damn good time working my way through it. I give much of the credit to our booth rep turned head chef, who called the shots and guided us to a number of 3-star performances with military-like precision. In time, the chaos settled to a more cohesive and streamlined machine as we prepared dishes like salads, burgers, and sushi. We began to settle into specialized tasks; one person calling out the orders and overseeing operations, two people chopping, cooking, and assembling foods, and another manning the dish washing. After my play session, I could see how Overcooked 2 could easily be a sleeper hit when it arrives later this year, with its unique charm and chuckle worthy entertainment. This sequel is set to build on the exciting and unique recipe that comprised the tasty concoction of the first entry, while further fleshing out the gameplay. The developers promise new and more elaborate kitchens, greater obstacles, additional recipes, and an expanding roster of chefs. More notably, though, this game will sport an online co-op mode for the first time; a feature that’s almost sure to inject an additional dimension of fun and replay value. Though, considering how much the game encourages, if not downright revolves around communication, usage of a mic will likely be vital. This is a factor that might make some potential Switch owners a bit wary, what with its notoriously cumbersome and inconvenient means of online communication. Still, we should be in for another entertaining romp in the kitchen with this under-the-radar sequel, no matter the platform. 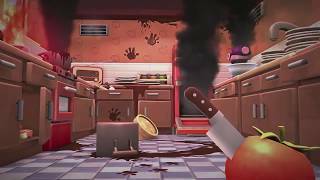 Look to get cooking on Switch, PS4, Xbox One, and PC on August 7th.